DETROIT, Michigan, April 5, 2013 (ENS) – A success in the early 1900s, electric automaker Detroit Electric is back – with a $135,000 limited-edition battery-powered sports car. The SP:01 was launched Wednesday at Detroit Electric’s new headquarters in the historic Fisher Building in downtown Detroit, where the company has signed a long-term lease. The high-style, high performance, zero-emissions car will be on sale in many of Detroit Electric’s target markets by the end of August. The two-seater has a range of “just under 190 miles” between charges, the company says. Styled by Detroit Electric’s Head of Design, Jerry Chung, the SP:01’s angular lines give the car what he calls “a bold, imposing design” while optimizing aerodynamic efficiency. The bespoke bodywork is constructed of carbon fiber. A lightweight battery pack and the carbon-fiber bodywork means that the SP:01 weighs in at just 2,354 pounds. The rear-wheel-drive SP:01 features a compact, mid-mounted 201 bhp electric motor. “The SP:01’s innovative powertrain delivers instantaneous torque through a four-speed manual gearbox for optimal acceleration,” the company says. An automatic transmission is available as an option. An all-disc braking system, anti-lock braking and electronic stability control are fitted as standard, as is regenerative braking technology. The car’s energy recovery mechanism uses the motor as a generator, recovering kinetic energy and using it to recharge the batteries. Detroit Electric’s home charging unit will enable an SP:01’s full battery recharge in 4.3 hours. The car will be built in Wayne County, Michigan at a dedicated plant with an annual capacity of 2,500, company officials said at the reception. 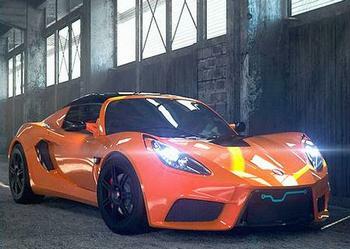 Detroit Electric plans to build only 999 examples of the SP:01. “We are proud to become the fourth car manufacturer born out of Detroit, and the first to manufacture a pure electric sports car from Michigan,” said Don Graunstadt, CEO, North America Operations at Detroit Electric. “We are committed to doing our part for this great revival of Detroit through innovation, entrepreneurship and determination – what we like to call Detroit 2.0. Our investors and management team are thankful to the State of Michigan for the help provided in allowing Detroit Electric to carry on the legacy that began in Michigan so many years ago,” Graunstadt said. Early in the last century the electric vehicle industry was flourishing in Detroit and Detroit Electric was a big part of it, selling more electric vehicles than any other company. Detroit Electric began life in 1906 and went on to make some 13,000 vehicles by 1939, setting the EV production world record for the 20th century. By 1912 there were many American electric vehicle makers, with Detroit Electric both the market leader and the most prolific. Customers included Thomas Edison, Mamie Eisenhower, John D. Rockerfeller Jr. and Clara Ford, the wife of auto pioneer Henry Ford. The Michigan Economic Development Corporation President and CEO Michael Finney welcomed Detroit Electric to the community. “Detroit Electric’s decision to establish its new headquarters in Detroit is great news, because it builds on Michigan’s automotive heritage and places the company in the world’s automotive epicenter with a business climate that will enable its success,” he said.